I don’t want to freak anyone out, but Christmas is NEXT MONTH. I know. Can you believe it? It seems like just yesterday I was rolling my eyes at store Christmas decorations in July, and yet here are! Which is why, as much as I hate to admit it, I’m entering into Christmas gear. This Christmas, my oldest son will be three years old, which means two things: One, he is finally old enough to “get” Christmas. Two, he is still young enough to not get Christmas at all. For him, Christmas is about presents and nothing else, not even a little bit. Just last week we attended his cousin’s second birthday, where he “helped” her open all of her presents. If there is a present anywhere close by, he’s like a dog on a squirrel. Isaac is getting to the age when we want him to understand the meaning of Christmas, but this present obsession is making it hard. The story of Jesus seems so outside his realm of priorities. However, I also know his obsession won’t last forever. One day he won’t be subject to the whims of toddler instant gratification, and the lessons we teach him now will start kicking in. That’s why I want to be intentional about shepherding his heart and helping him focus on Christ. To that end, I’m doing something special this month that’s fun for me and will hopefully be helpful for you. 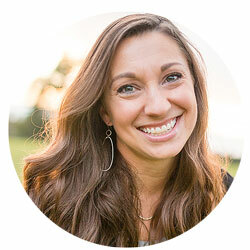 I’m partnering with Samaritan’s Purse to offer some ideas for being intentional with your kids at Christmas. This week, I’m sharing about Operation Christmas Child. – Each year Operation Christmas Child collects shoebox gifts filled with toys, hygiene items, and school supplies to demonstrate God’s love in a tangible way to children in need all around the world. 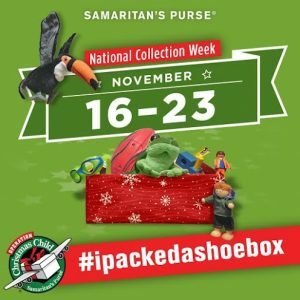 – The National Shoebox Collection is November 16-23, 2015. During this week, you can drop off your packed shoeboxes at local drop-off sites, which you can find here. 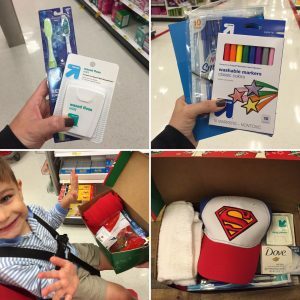 – All you have to do is pick a gender and an age range (2-4, 5-9, or 10-14), and then buy items for the box! – You can find instructions for packing your box here, and gift suggestions here. – When you’re done, click here to get a Follow-Your-Box tracking label. This last part is such a cool way to make the process tangible for kids. It can help them feel more connected to children in other parts of the world. 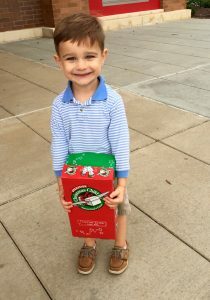 Last week I took Isaac to the store to shop for his own shoebox. He’s still a bit young to understand the concept of other children’s needs, but I hope this can be a tradition that shapes his little heart and mind. I decided to assemble a box for a Boy age 10-14, so we picked out some pens, notebooks, toothbrushes, and soap. Our favorite part was picking out a “wow” item, something a child would really enjoy. We decided to get a Superman hat, a mini-football, and some gummy bears. In the beginning, my intention was to teach Isaac generosity, and I believe that it will one day. However I also enjoyed packing the shoebox for myself. As I walked through the store with my son’s hand in mine, I kept imagining another little boy out there, opening this box and digging through its contents. I really hope that, whoever he is, will feel the love of Jesus. 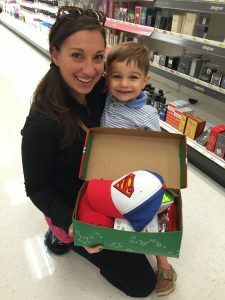 If you have kids and you’re looking for a fun and creative way to honor Christ this Christmas, I encourage you to pack a shoebox (or two or three!) and drop them off between November 16-23 at a location near you. 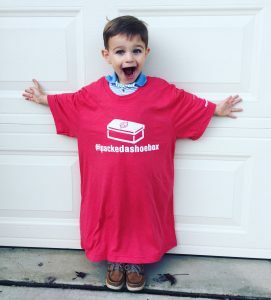 And if you do, be sure to share a photo on social media with the hashtag #ipackedashoebox. You might just inspire others to do the same! Hello Sharon. My parents were born in Holland in the 1930s. After the Canadians liberated Holland my mother received from USA and Canada shoeboxes with shoes and candy and a doll. Jesus looks after His Children.